"6kbbs V8.0 is a PHP + MySQL built using high-performance forum, has the code simple, easy to use, powerful, fast and so on. It is an excellent community forum program. The program is simple but not simple; fast, small; Interface generous and good scalability; functional and practical pursuing superior performance, good interface, the user's preferred utility functions. Forum Technical realization (a) interface : using XHTML + CSS structure, so the structure of the page , easy to modify the interface ; save the transmission static page code , greatly reducing the amount of data transmitted over the network ; improve the interface scalability , more in line with WEB standards, support Internet Explorer, FireFox, Opera and other major browsers. (b) Program : The ASP + ACCESS mature technology , the installation process is extremely simple , the environment is also very common." "(1) PHP version : (a) 6kbbs V8.0 start using PHP + MySQL architecture. 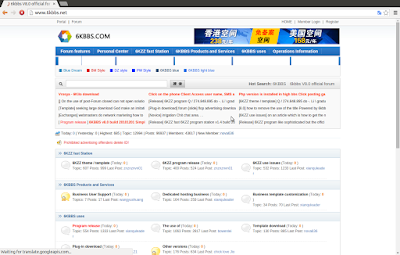 (b) Currently ( July 2010 ) is still in the testing phase , 6kbbs V8.0 is the latest official release. (2) ASP Version: 6kbbs (6k Forum) is an excellent community forum process . The program is simple but not simple ; fast , small ; interface generous and good scalability ; functional and practical . pursue superiority , good interface , practical functions of choice for subscribers." Several 6kbbs products 0-day web cyber bugs have been found by some other bug hunter researchers before. 6kbbs has patched some of them. "The Full Disclosure mailing list is a public forum for detailed discussion of vulnerabilities and exploitation techniques, as well as tools, papers, news, and events of interest to the community. FD differs from other security lists in its open nature and support for researchers' right to decide how to disclose their own discovered bugs. The full disclosure movement has been credited with forcing vendors to better secure their products and to publicly acknowledge and fix flaws rather than hide them. Vendor legal intimidation and censorship attempts are not tolerated here!" A great many of the web securities have been published here. We can see that "userpass" stored in cookie was encrypted using "$userpass" user password directly. And there is no "HttpOnly" attribute at all. Since md5 is used for the encryption, it is easy for hackers to break the encrypted message.